Coming to our Heritage Gallery when the Museum opens: A piece of WWII history. ORNITHOLOGIST Guy Charles Madoc did not let his time as a prisoner of war stop him from writing about his passion. By May 1943, less than a year after his -capture by the Japanese during World War II, the Briton had illicitly completed a 146-page manuscript titled “An Introduction To Malayan Birds” while being incarcerated in Changi Prison. Mr Madoc, an officer with the Federated Malaya Police, was 32 at the time and wrote most of it from memories of his bird -watching trips to Malaya’s jungles and rocky islands. Writing materials, such as a typewriter and paper, were borrowed and taken covertly from the Japanese commandant’s office by a fellow prisoner. The book went on to be published by the Malayan Nature Society and was reprinted in 1947 and 1956. Mr Madoc’s original copy – bound in red leather ripped from the seats of a wrecked car in war-torn Singapore – is still kept within the family. However, history buffs will be able to get a glimpse of a replica of the original copy when the Lee Kong Chian Natural History Museum opens its doors next year. Scanned pages of Mr Madoc’s book, with black-and-white photographs, taxidermied birds, as well as models of the original book cover and the typewriter he used, will go on display in the museum’s Heritage Gallery. 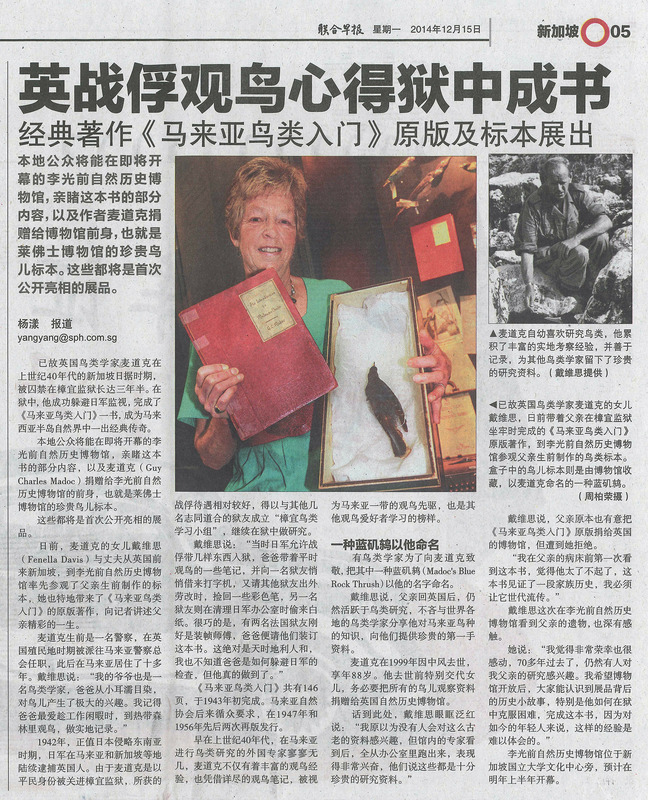 It will be the first time that Mr Madoc’s works will be displayed in a museum, and for his daughter Fenella Madoc-Davis, the icing on the cake is that her father ‘s works will be showcased in Singapore’s first natural history museum. The retired primary school teacher said that her father ‘s love for birds was cultivated from the time he was young by his father Henry, also an avid birdwatcher. Among his favourite bird species was the pied hornbill, “which had a strange squawk”; the brown booby; and the Madoc’s blue rock thrush – which was named after him after he discovered it in 1940. Mr Madoc was a native of the Isle of Man, an island sandwiched between England and Ireland, and he first arrived in Penang by boat in 1931. The then bachelor had harboured aspirations to follow in his policeman father ‘s footsteps and, after joining the British colonial office, he was sent to South-east Asia. Then, tragedy struck – twice. First, the Japanese seized Mr Madoc as a prisoner of war in 1942. Then, in 1943, David died of diabetes at the age of six. Mr Madoc’s colourful literary work, produced in such dark times , proved an inspiration for his daughter. 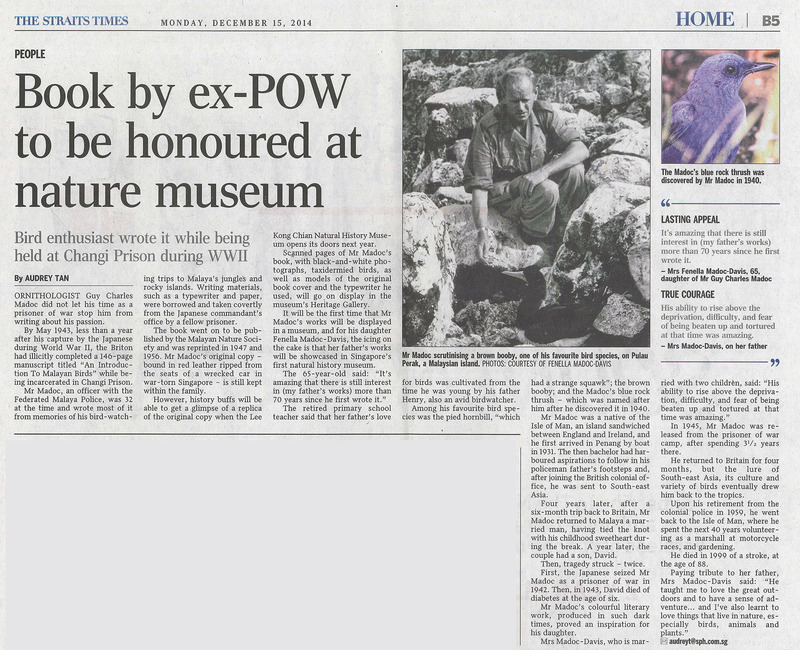 In 1945, Mr Madoc was released from the prisoner of war camp, after spending three and a half years there. He returned to Britain for four months, but the lure of South-east Asia, its culture and variety of birds eventually drew him back to the tropics. Upon his retirement from the colonial police in 1959, he went back to the Isle of Man, where he spent the next 40 years volunteering as a marshall at motorcycle races, and gardening. He died in 1999 of a stroke, at the age of 88.